It all starts with horse hoof anatomy. As the saying goes, “No hoof, no horse.” When you understand the anatomy of a hoof you can take better care of it and greatly increase the longevity and usefulness of your horse. The hoof wall is made up of horny tissue. The hoof continues to grow throughout the life of the horse, much like fingernails in humans. Just like fingernails, the horny shell has no nerves or blood vessels. The horny hoof wall grows out from the coronary band that sits just at the hair line above the hoof. The hoof itself is thick and hard, yet pliable. The hoof wall is thickest at the toe and thinner at the heel. 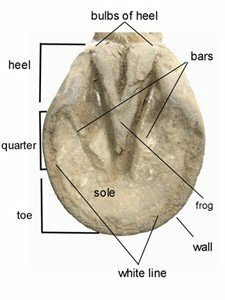 The ideal horse hoof anatomy should have a nice rounded toe and a wide heel base. A narrow heel suggests the presence of navicular disease or the tendency toward contracting navicular. The hoof will soften in wet conditions and dry out in dry conditions. Adding a bit of vegetable oil to your horse’s diet will help keep the hooves strong and moisturized from the inside out. Just like human nails and hair, the horses hoof and coat will respond to oils in the diet. 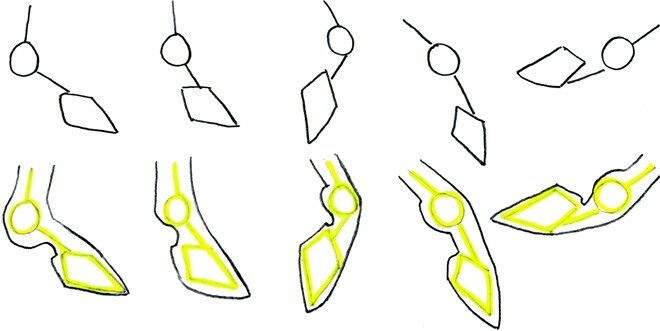 Looking at the illustration you can clearly see the structure of the bottom of the hoof. The most pronounced feature is the triangular shaped frog. The frog acts as a shock absorber. It is the softest part of the horses hoof and expands with each step, as does the flexible heel of the hoof. Horse shoes should be slightly wider than the heel of the hoof to allow for this expansion. Did you know the frog sheds twice a year? The white line is the transitional tissue between the tough horny outer wall of the hoof, and the sensitive inner tissues of the hoof. When a farrier is shoeing a horse, he places the nails into the horny wall that has no nerve or blood vessels. 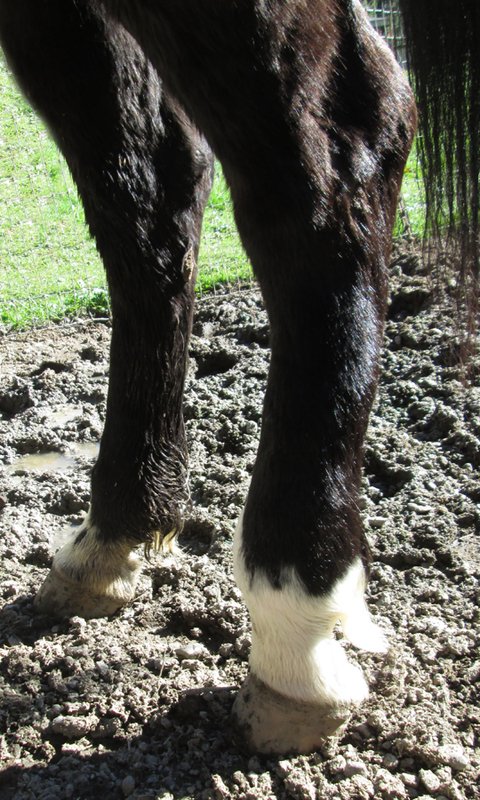 A white line that is pierced by a farriers nail causes pain, lameness and possible infection. The bars of the hoof serve in several ways. They help to take up some of the weight that is placed on the hoof wall and they keep the hoof from over and under expanding. The bars also spread out slightly with each step to help drive the ‘heart pump’ action of the hoof. 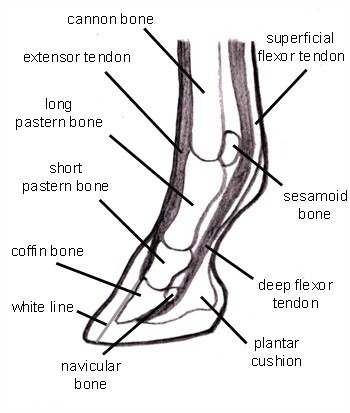 The coffin bone is the ‘toe’ bone of the horse’s foot. This bone is shaped like a small hoof with flared sides. This is the bone that rotates downward to pierce the sole of the foot in a horse with founder. The coffin bone meets the short pastern bone while the tiny navicular bone just behind them both inside the horses hoof. Did you know that a horse has no muscles in their lower leg? The lower leg is made up of bone, ligament and tendons, and of course the all important hoof. The horse hoof anatomy allows the hoof to act as a second heart. With each step the horse takes, the flexible hoof expands and contracts, forcing blood back up the horses leg toward the heart. This is why keeping a horse in a stall with little activity is so unhealthy. The lack of exercise and movement cuts down on circulation. 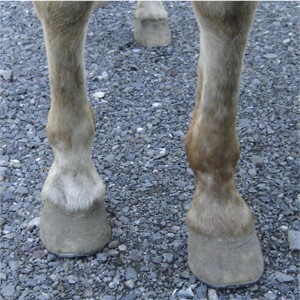 This can cause a horse to “stock up”, a condition where the lower legs are swollen from lack of circulation. The sole of the hoof is harder than the frog and softer than the outer hoof wall. It is flexible and acts at the ‘heart pump’. The sole in the front hoof is round shaped, while the sole of the back hoof is more oval shaped. A concave sole is preferable to a flat sole. A concave sole reduces concussion to the joints in the horse’s leg, offers better footing in rough terrain, is less apt to stone bruise and is less prone to navicular disease. The back hoof is usually more concave than the front hoof on a horse. Want more detail? Check out this fantastic at-a-glance hoof cart! 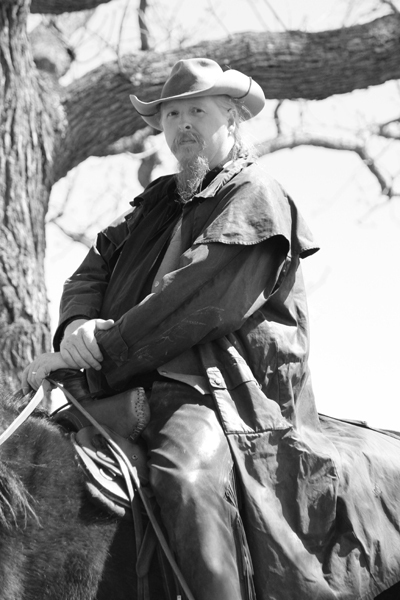 Fun interview with farrier Jarl Viale. Learn about this common disease and how it is treated. 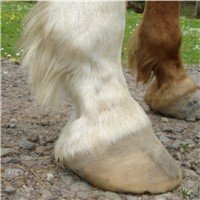 Need to know Horse Hoof Care.